You might think Superman’s presence in Metropolis would be a major deterrent to crime. As one criminal tells another, “He can hear you.” And with those super-peepers of his, he can see you coming a mile away, which isn’t so far, given his super-speed. So why would ANY run-of-the-mill criminal ever choose to commit a crime in Metropolis? It’s the kind of question that has kept comic book fans awake since were nine years old. And Bendis addresses it. It’s refreshing, and I hope it’s a trend that continues in this new Superman title. One might think Action Comics and Superman are enough, but back in my day (he said, hitching his britches up), we had six regular Superman titles. 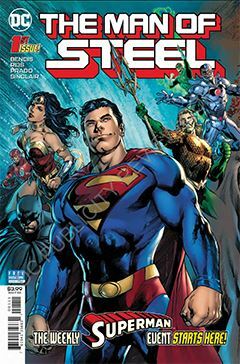 The storyline is consistent with current Superman lore: Lois and Clark are married, raising their son Jonathan, and Clark continues his Superman career while working for the Daily Planet – which is another thing Bendis addresses. Newspapers are dying, and the Planet is no exception. The fact that it’s a great metropolitan newspaper just means it has a great deal more at stake. Meanwhile, there are call backs to the destruction of Krypton, which may have an impact a generation later, now that Kal-El has grown up and become the defender of the weak. How that plays out is something we have to look forward to. Seeing a nice simple Superman story, in which he flies about the city doing good (complete with red trunks) somehow makes me feel all is right with the world of comics. I’m eager to see more from Bendis.